Cruickshank is a dynamic striker who is 6-3 (1 NC) in the UFC including a highlight reel knockout of Erik Koch. Dariush, an Assyrian-American fighter born in Iran, is 9-1 and is coming off a pair of impressive wins. Both fighters need to win impressively to turn heads in a deep lightweight division. Round 1. Cruickshank lands a high kick a minute in and Dariush answers with a stiff kick to the body. He lands another moments later. 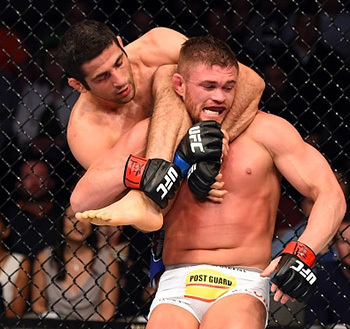 Cruickshank is using his hands more than Dariush, who keeps setting up kicks and is targeting the body in particular. Dariush follows with a knee and another of those vicious body kicks. Cruickshank looks for a flying knee but Dariush catches it and takes Cruickshank down. Dariush follows with elbows and punches on the ground and looks for a D'Arce choke late that he can't apply. 10-9 Dariush. Round 2. Cruickshank looks for a takedown early but can't get it. Dariush pushes in and lands a knee to the head. A scramble ensues and Dariush looks to take Cruickshank's back. He is too high but transitions into an armbar attempt. Cruickshank avoids that and grabs a body triangle. He sinks in a rear naked choke and gets the tap. 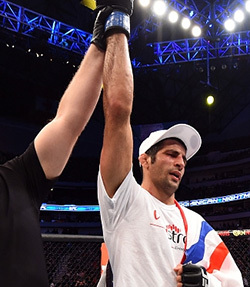 Winner: Beneil Dariush, submission, round 2. Please go to Beneil's pages and click likes and send your congratulations to him.